“After reaching a little pass, you will have to cross several small snow fields,” our French hiking guidebook states. But we have already been plodding through heavy wet snow for the past half hour. This summer, the Alps are colder than usual, and the snow has not melted away. At least the clouds are drifting in a different direction, and soon we get our first glimpse of the mountain we have climbed up here to see: The Mont Blanc! It is indeed very white and very big! Together with scores of other hikers who have been longing for a pleasant day to try a rather strenuous tour, we are on our way to the top of Mont Buet. At 3096 m one of the higher mountains around, it is also called the “Mont Blanc for the Ladies” because it is accessible without any high-altitude mountaineering gear. In the 19th century, alpine explorers have hiked up Mont Buet just in order to get a better look at Mont Blanc and to figure out a possible route to conquer Europe’s highest mountain. In 1760, the Genevan scientist Horace-Benedict de Saussure even set out a prize for the first person to climb Mont Blanc. It took 26 years for a local guide to claim that prize. The Chamonix guide Jacques Balmat was not only vigorous and determined, but also stingy enough to survey the possible routes alone. After a cold bivouac night, spent sitting on the blank ice well above 3000 m, he thought he had finally worked out a route. But no ascent was considered complete if it was not accompanied by some scientific experiments. Cold and breathless, he ran down to the village to fetch a “learned man” with a barometer to accompany him (and also some blankets for the next night on the glacier). – and together they went all the way up again. On 8 August 1886, Balmat and Michel Paccard were the first persons to stand on the summit of Mont Blanc. 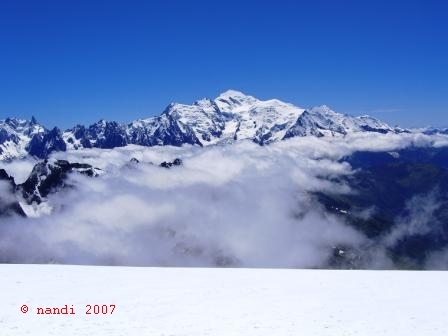 From then on, Chamonix became famous as a mountain resort and sightseeing spot in the Alps. Especially British tourists flocked to the village to see the spectacular glaciers, get a glimpse of Mont Blanc, or even to climb it. Perhaps because it is so popular – and so expensive – the Chamonix valley is dotted with campsites. Ours has about 200 slots for caravans and tents, its own wireless hot spot, and (very French!) a baguette service in the morning. All the sanitary facilities are concentrated near the reception and it takes 4 minutes to reach the toilets from our tent site (3 minutes if running). Outside the row of toilet cubicles hang two enormous rolls of toilet paper. It seems everyone unrolls meters of toilet paper there. “Not that I need all that,” a British lady explains to her friend, slightly embarrassed. “Oh no,” the friend nods sympathetically, “but you would rather have too much than too little, wouldn’t you?,” unrolling a huge wad for herself. After five days of continuous rain the green grass of the campsite has turned into a brown mud field. Our sleeping bags and all our clothes have become damp and wet, and we have got so much used to the constant dripping of rain drops on the tent tarp that we wake up if the rain stops for a few minutes during the night, only to curse when it starts raining again. Likewise, our French, English, and Dutch neighbours sink ever deeper into a damp rainy-day mood. Finally, one evening, the clouds suddenly clear, and the glaciers on the flank of Mont Blanc glitter pink in the evening sun. Dozens of campers gather in the square in front of the reception. They take pictures of the characteristic Drusenspitze, some with huge semi-professional cameras, others with their mobile phones. Children run happily around, glad to play outdoors again. Ah! Now we remember why we wanted to spend this summer in the Alps. Fergus Fleming: Nach oben. Die ersten Eroberungen der Alpengipfel. Piper: 2006.